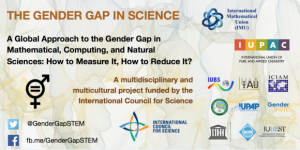 The Internation Science Council (ISC) project ‘Gender Gap in Science‘ is a global approach to addressing the gender gap in mathematical, computing, and natural sciences, looking at how to measure the gender gap and how to reduce it. If you are involved in these sciences at any level, including as a student, you are invited to share your career and education experiences before 31 October 2018. The project is collecting data via a survey to develop a broader picture of the status of mathematicians and scientists across the world. The data that you contribute will help inform interventions by ISC and member unions to increase participation, especially for women. A really nice summary of the project and survey can be found on the project website. If you have questions, please contact John Tyler of the Statistical Research Center at the American Institute of Physics. Please remember to send us a quick email with your feedback to gro.e1555873493tamil1555873493c-cra1555873493ps@ec1555873493iffo 1555873493. Thanks!